At Nicole's Table we love foodies who love to learn new recipes, trade stories, and meet new people. We explore foods from across the Caribbean... some in their traditional forms and others with our own “Caribbean twist” which marries Caribbean and other cuisines. Each “class” includes recipes for a starter, main course and a dessert along with our “old fashioned” rum punch and other drinks. Our creations are served on our veranda overlooking the Caribbean and St. John's Harbour. Whenever possible, Nicole likes to use fresh fruit, vegetables, and herbs so that her creations are always delicious and healthy. Ingredients can vary class to class...depending on the season and what the market has to offer...so each class always has its own flair. The view of the Caribbean Sea from our verandah is spectacular, the breeze refreshing, the food tantalizing and the hostess knowledgeable and entertaining...all combining to create a unique and enriching experience. Nicole's Table has a TripAdvisor rating of 5/5, is a top rated tour in Antigua, and hsa won TripAdvisor's coveted Certificate of Excellence for three years in a row... in 2015, 2016, and 2017. 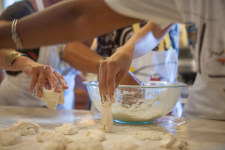 Our regular classes include All About Jerk, Cooking with Rum, Coordinating Curries, and From the Sea. Click here for all our classes. 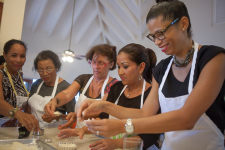 Nicole's cooking classes are designed so that you can learn hands-on, or sit, watch, talk, and eat. Classes are small and personal. 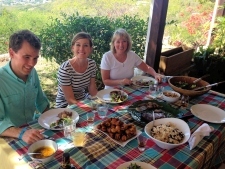 This way our classes are more like close friends sitting down for a home cooked meal, than a formal learning experience. Classes start at 11:00 am and typically end around 3:00 pm. Since we only hold a limited number of courses per week and seat no more than 10-12 people at a time, a paid deposit is required. Cancellations receive the full deposit (minus bank/Paypal costs) if made 24+ hours before the class. To make a reservation, please go here, select a class, select Book Now!, and then follow the steps in our booking engine. If you want to just contact us, then go here or send an email to reservations@nicolestable.com.